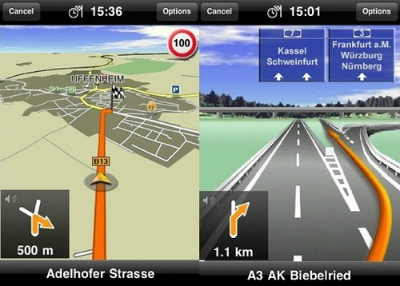 With the upcoming release of the iPhone 5, we’ve been getting a surprising number of requests to talk about iOS-based navigation apps. So today, we’re taking a bit of a look at some updates to Garmin’s navigation apps, specifically, Navigon MobileNavigator. While iOS had a mapping system built in, Maps, it’s been in line for some substantial overhauling, seemingly with every new release of iOS that comes out. Since for a long time, Google and Apple were seemingly irrevocably joined at the hip by virtue of Apple’s heavy reliance on many of Google’s mapping systems like Street View. Given the rise of the Android-based systems, Apple and Google working together just probably didn’t seem like the right path to take any more, which left Apple focusing more intently on its own in-house development, Maps. Maps has plenty of great features in its own right, but at the same time, there were also plenty of users left a bit disgruntled that the features they liked, and were used to, from previous incarnations were now lost. This has left room for third party makers like Garmin to step up their game and offer an alternative that’s more to users’ liking. Perhaps most interesting of Garmin’s upgrades is the decision to bring one of the most missed features about iOS’ Maps system, Google Street View integration, to its own Navigon MobileNavigator app. Many have appreciated Google Street View for its ease of use and, in some cases, its sheer entertainment factor, so seeing this one in Garmin’s apps is a welcome treat. Also slated for addition is what’s called “Last Mile”, that will be very helpful for those who have to park some distance from their destination. Last Mile adds a geotag to your car’s location, then provides pedestrian-specific directions both to the target location and then, eventually, back to the car. Basically, it looks like Garmin wants to take a run at those dissatisfied with how Apple’s turning out with Maps so far. Given that the changeover is relatively recent, it may be premature to say that this is a good idea, but then, for people who need good navigators and need them right away, the perfect version of Maps in a couple updates from now is a couple updates too many. Admittedly, there are plenty of small businesses out there who can use navigation apps. Anyone who has to regularly go to different places as part of a normal work day will find this a terrific piece of work indeed. But it’s not just navigation that helps make sales; cloud-based telephony tools like instant conferencing and call recording can not only help get sales, but also help keep them coming in after the initial sale is made. There are a growing number of navigation apps–much like there are a growing number of apps in general–for iOS, so those longing for something different than Maps can offer should find some welcome treats in store. This entry was posted in iOS Apps, iPad Apps, Small Business, Virtual Office by Steve. Bookmark the permalink.